This past weekend was my 27th birthday. My birthday frequently falls on Labor Day weekend (I was even born on Labor Day!) so Ryan and I take advantage of the extended weekend to celebrate – this year by visiting Portland! I love Seattle, but Portland rivals it as my favorite city in the United States. Portland is a little weirder (we saw multiple people in various locations with cat tails and ears) but less crowded and less expensive. Ryan spoils me on my birthday each and every year. We’ve celebrated 5 birthdays together since we started dating. This year was no exception! So today I want to link up with Happy Fit Mama for High Five Friday and share my five favorite photos from my birthday weekend! 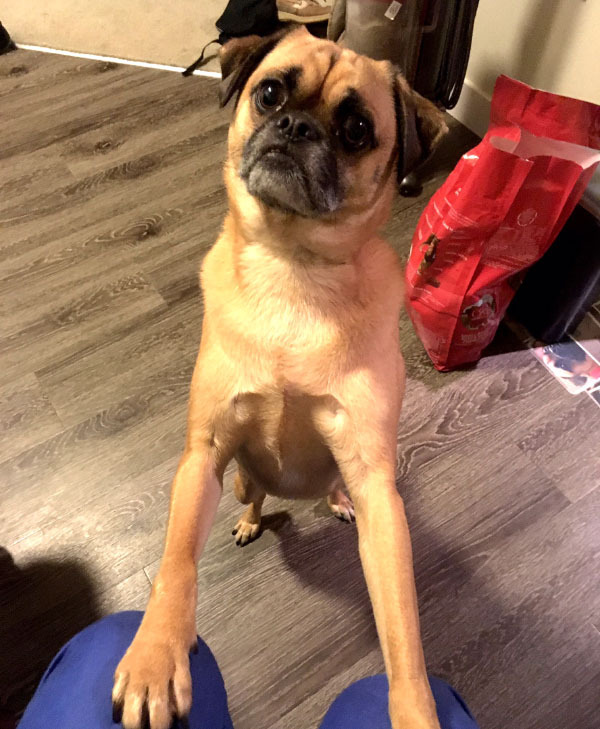 Charlie kept begging for attention when I opened gifts and enjoyed my birthday breakfast. Eventually, he realized what was going on and offered me his Chewbacca stuffed animal as a gift. I always choose my favorite foods over a fancy meal out for my birthday. 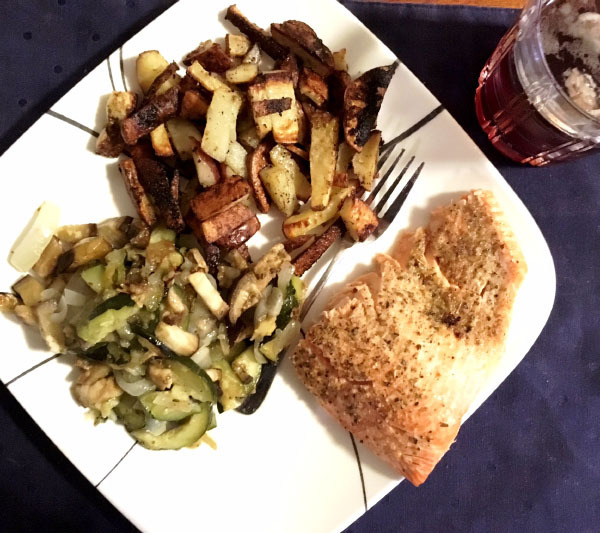 This year Ryan made me wild salmon, roasted red potatoes, and roasted eggplant and zucchini. This meal was so delicious that I requested it the next night! The drink in the right corner is a sloe gin mixed with soda water. Ryan gave me a bottle of sloe gin, which was a spirit we enjoyed during our trip to London. It’s a sweeter version of gin and is so flavorful. 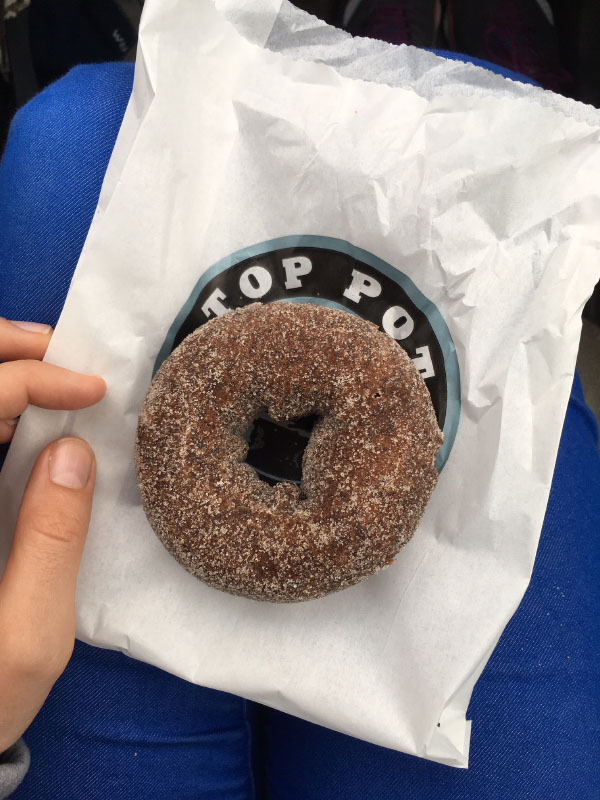 I prefer savory over sweet now, but I cannot pass up a Top Pot Donut on my birthday. I got the Chocolate Sandcastle, which is a chocolate cake donut dusted in coarse sugar rather than frosted. Better than cake! Multnomah Falls provided scenery that was well worth the line of cars and crowded parking lot. This waterfall is over 600 feet tall! We were going to hike up to the look-out point at the top of the falls, but by the fifth out of eleven switchbacks my legs were feeling the effects of marathon training and beer with lunch. So instead, we enjoyed the views some more before returning home. I adored the perfectly crystal clear blue of the Columbia River! 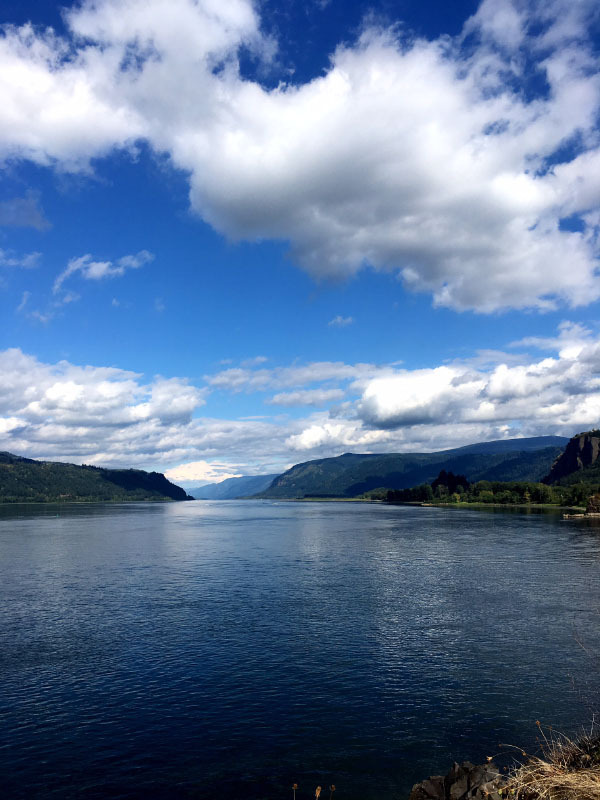 Combined with the mountains in the background, the Columbia River is panoramic perfect. Yep, I love it here in the PNW! 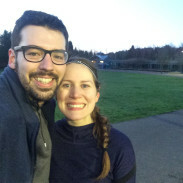 Most of all, this trip made me itching to go back someday and run the Portland Marathon. Oh, and go back for Deschutes Brewery (where we went after the 2015 Portland Marathon) since their outdoor seating was closed this weekend and we had Charlie with us. What’s your favorite birthday meal? I love Portland! It’s been a few years since I’ve been but I have plans to go back sometime soon. There’s so much to see and do. And Multnomah Falls was so beautiful. We were there in July and had the place to ourselves. I don’t think we saw one other person while we hiked to the top of the falls. I guess we had the right time! Wow that’s awesome how you got to see them so empty! I bet there were even more beautiful without having to navigate crowds. looks like a wonderful birthday! I am glad you had a donut – I am not relating to this savory over sweet thing lol…New York is my favorite but I did learn to appreciate Chicago and other cities as I got older. Thank you! I’m going to blame marathon training right now for why I want all things salty and savory. Although the donut was so good that it was tough to not go back in for another! WOW! What an incredible way to celebrate!! Happy Birthday and so glad you were able to fully enjoy it and celebrate it. I’m a big believer in celebrating birthdays BIG and looks like you two outdid yourselves. Poor Charlie though…he is just too adorable!! Thank you! Ryan always spoils me with trips when he can! Charlie got to go to Portland so it wasn’t even like he was missing out! Well, maybe missing out on a nap. Ooo that reminds me that I need to get one of those apple cider donuts from the pumpkin patch. And then a pumpkin one, because obviously. I really hope that I have a little puppy face staring up at me on Sunday! Happy birthday again, Laura! You have accomplished so much and have so much to be proud of, but mostly, I am glad that you are just in such a great place. Thank you so much, Susie! Ooooh yes get that apple cider donut. Those are the best parts about fall apple and pumpkin picking. And I am so, so sorry about the puppy not working out. You will get one soon!! Looks like a perfect birthday! 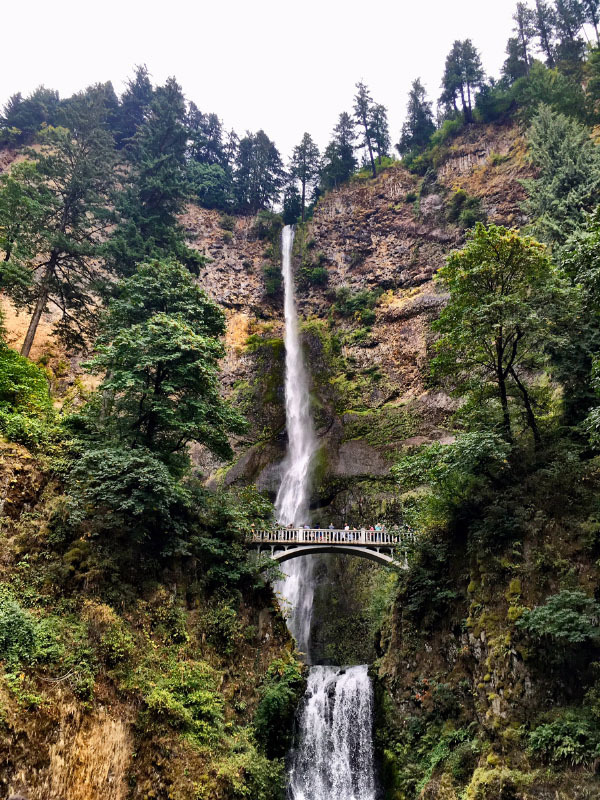 So cool that you get a long weekend to celebrate 🙂 I absolutely love waterfalls so I think I need to visit Multnomah Falls. Favorite city would have to be Boston or Denver. Thank you, Gretchen! Yes, you should see the falls – they’re spectacular! Happy belated birthday! Looks like a great weekend of birthday adventures. This also makes me excited to go to Portland for the first time in October! Those falls are definitely on my list to visit. Thank you! You will love Portland – it’s such a fun city and the people support the race so much! Then there’s so many great places to eat afterwards. If you like beer or burgers, Deschutes Brewpub is a fun and delicious place. I drove down to Tacoma, picked up my friend Renata (you know the one I wrote about and posted a picture of who has brown curly hair and dresses up in scarves and skirts for our coffee dates?) and we drove down to Portland for lunch at a brewery, and then I got my dreads crocheted at a funky little salon there. I LOVED IT ALL. Good choice for your birthday trip! Those waterfalls though… WOW. Their breweries are so good! Well worth the drive especially if you can pick up a friend on the way. Gorgeous pictures and this sounds like the perfect way to spend your birthday weekend! Thank you! It was! Hope you have a great weekend! Multnomah Falls looks amazing. Would love to go there one day. So glad you had a fun birthday weekend!! You would love it! There is so much fun stuff to do in Portland and it’s such a laidback, outdoorsy city. And thank you! My favorite US city is Boston. My favorite birthday meal is sushi. Thank you! I’ve heard so many great things about Boston, some day I hope to visit there! Happy birthday! Mine was this past weekend too! Was yours the 3rd? It looks like you had an amazing time. I love Portland, I actually lived there for 4 years before I moved to the Netherlands! 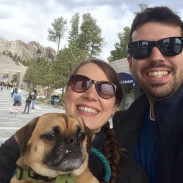 Favorite city in the US – that’s tough! I would have to say Chicago. But I do love Portland. And I love New York. But I also love San Francisco. Oh and Austin… so hard to choose!! Favorite birthday meal – that’s tough too! I think just going out for a meal on my birthday is great – but for example I love grilled salmon or a really excellent burger. And beer. I need to have a beer on my birthday 🙂 This year we actually had italian (and I had a rosé wine) because we had a long run planned the next day. Plans this weekend – going to the hairdresser for sure and I have a 10 mile race on Sunday. Happy belated birthday! My birthday was on the 4th. That’s so awesome that you used to live in Portland! And beer is an essential on a birthday. Good luck on your race! It looks like you had a wonderful birthday trip and yay for that delicious meal! I would almost rather have something cooked for me than going out too but you did the right thing by treating yourself to that donut (imho, I’d rather have ice cream or a little treat like that than cake, too). Portland looks like a beautiful place and I would love to visit someday. I think my favorite city I have visited is Washington DC. Thank you! Cooked meals just have exactly what you want – and then since it’s a birthday someone else is doing the cooking 🙂 I used to love cake but now it’s just too rich! My favorite city in the States is NYC. But I’m traveling in Japan right now and it is amazing. You would love it here. 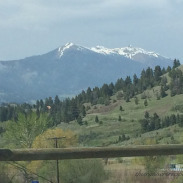 Lots of beautiful hikes and amazing food! Hey, we are birthday buddies (almost, mine was Tuesday), but strangely I have always associated my birthday more with the start of school than with the long weekend. Consequently I usually celebrate by buying myself some fiction books to offset all the textbooks I just had to buy.